Early in our work we became aware of two basic problems in developing countries, the tremendous deforestation and the high incidence of imported construction materials. Thus, we began to seek solutions for roofs that would use less wood, as well as substitute imports. Having read about investigations into handmade fiber-concrete roofing sheets, we began to experiment ourselves. Soon after the first roofs had been laid we discovered that not only was it difficult to obtain a perfect fit between the sheets, but also that they were fragile and difficult to handle. After some times cracks appeared and we realized that they were not feasible for our purposes. It was clear that the size had to be reduced and some sort of mechanical process developed in order to guarantee consistency of size and fit. About that time, SKAT organized a seminar in Switzerland where it gathered together people from many countries who had been experimenting with hand made roofing sheets. Sofonias was prepared to tell the seminar to forget everything. Then, another participant revealed a small vibrating machine and polyethylene mould to make roofing tiles. We bought a machine and began production! Convinced that Micro Concrete Roofing (MCR) tiles were an ecologically and economically viable solution for roofs, we presented a project to the Swiss Development Cooperation. From the modest beginnings of twenty pilot plants in six countries by 1990, MCR has spread throughout Latin America so that at the end of 2002 there are about 650 workshops currently employing more than 3000 people in twelve countries. All these small businesses have raised their own financing and thus the program has been outstanding in the mobilization of capital. 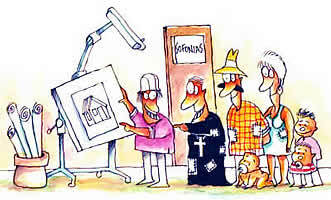 Annual MCR tile production in Latin America is around 3,000,000 square meters, about 50,000 roofs. Accumulated production has resulted in some 350,000 roofs. In any event, close to two million people have elegant, enduring and economical roofs over their heads! Throughout the past ten years the project has been able to develop a network of producers, consultants and university research institutes, and the activities have expanded to include other ecomaterials. The EcoSouth Network is the vehicle for dissemination, education, quality control and investigation. Its consultants have provided advice and introductory and follow-up courses well beyond Latin America, into Africa, Asia and the ex-Soviet Union. The lack of shelter in developing countries is a constant problem. Mainstream materials and technologies are far from being a solution for the poorest sectors of society, which have to struggle for their daily bread. It is clear that a response to this situation must have a radically different political and technological approach. Self-construction with clay has proved to be a most appropriate response in several countries of Asia, Africa and Latin America and, perhaps, it is the only possible way by which poor people can get a decent house. In some Asian countries, such as Tajikistan, clay is taken directly from the ground and molded in the foundations to build up walls which grow higher as the clay dries. However, this article concerns itself with adobes or sun-dried clay bricks and their correct and safe use for dwellings according to experiences in different parts of Latin America. The process begins with a correct selection of the soil to make adobes, that is, a soil not of pure clay, but that contains sand as well, in an approximate range of 40 to 60%. The soil is mixed with water and left for three days to achieve the appropriate fermentation. Then, some test adobes are made. In most cases, natural fiber is added to the adobe to obtain better results. If adobes crack in the drying process, sand must be added, but, if they do not resist a man´s weight once they are dry, clay is the material to be added to make them stronger. In any event, a practical test must be carried out in order to obtain the right mixture. Once the appropriate mixture is found, adobe production begins with the use of metal or wooden molds. Where seismic conditions exist, the molds should be square and a size of at least 30x30x8cm, often 40x40x8 cm is used. Half size adobes should be produced for easy fitting in corners and T wall intersections. 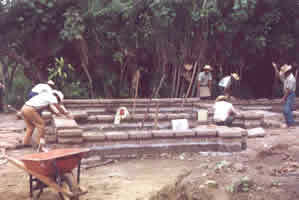 Adobe bricks are dried in the sun and they can be used after 10-15 days, once they are totally dry. The plot of land for an adobe house should be level, dry and solid, and the house must be placed on the highest part to avoid water penetration. Foundations must be strong, and 1.5 times the width of walls, for which cyclope concrete (calicanto) is recommended. The first layers of the upper part must be watertight in order to protect walls from erosion. To assure this, the foundation of cyclope concrete or bricks can extend above the surface. In area of high seismic activity, a concrete ring beam is obligatory. The first row of adobes must be laid using a lime mortar and, afterwards, the same clay material as used for the adobes is used as mortar. The shape of the house should be either square, rectangular or circular. Because of earthquakes, no irregular forms are recommended. During construction, all walls should be built up evenly, but never more than one meter a day, in order to protect the first layers from excess weight until the mortar has dried out. The total length of the wall should not be ten times greater than its thickness, otherwise, buttresses, also recommended for all wall intersections, would become necessary. Openings for walls and windows should not be wider than 1.20m and the sum of them should not be more than one third of the total length of the wall. . Openings may not be located closed to corners. A reinforced concrete beam should be placed on top of the wall, as a solid base for the roof construction. Often this beam may serve at the same time as lintel over doors and windows. There are no specific rules for roofs, but the overhang must be as large as possible in order to protect the walls from the rain. Be aware that in earthquakes it is often a collapsing roof that causes the walls to fall, so make sure you build a solid structure ! Walls must be plastered for protection from rain and erosion. Experience has revealed that a first layer, with a sand/clay mortar at a 3:1 proportion is best. Its thickness should be just enough to have a flat surface. Then, a finishing coat with a lime mortar (lime:sand=2:1) is applied with a thickness not exceeding 2mm. Investigations into various construction materials that can be produced locally have formed part of the ongoing activities at the Clay House Project in Otjiwarongo, Namibia. The onsite team comprised of several EcoSouth experts quickly saw the connection between the devastating bush encroachment and the wide-spread lime deposits throughout the region. Gate agreed to support investigation of the use of bush encroachment as the combustion material for burning lime and to ascertain the quality of lime. Upon determination that commercial quality lime could be produced, a second phase concentrated upon constructing a simple oven to burn lime with vistas toward its commercialization. 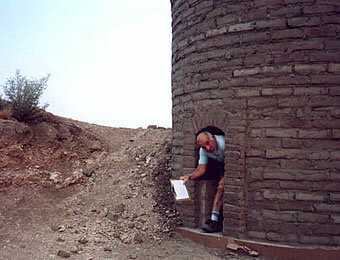 Prof. Nolasco Ruiz of CIDEM was the project leader and was able to construct a viable oven with clay bricks. The Clay House Project technician onsite could draw upon the farmhands as a workforce. This was an integral part of the project concept, that farmers could burn lime at the beginning of the dry season, thereby providing work for their farmhands. The lime-burning at Otjiwarongo has attracted widespread interest from other municipalities, as well as local organizations and farmers interested in using the lime. During the trial firings Prof. Ruiz and his team were able to produce nine tons of excellent lime. During the following months some of this lime was used to plaster the walls of the newly built clay houses, as well as a kindergarten built by a group of poor local women. The behavior of the lime upon slaking was very good and with simple sieving and some selective crushing the lime was ready for use. Only a small amount of bones (unburned rocks) were discovered, something that normally happens whenever lime production begins. Upon termination of the trial burnings, the technicians and workers were able to determine the exact percent of each size of limestone, as well as the time and temperature required for burning. The design of the kiln has proven to be correct and its performance was good. Some small cracks did appear, which was expected as the shrinking of the clay bricks (adobe) was factored into the design. Those cracks have been filled in and will not be a limiting factor to the kiln´s performance. The use of adobe bricks for the walls of the kiln helps reduce the price of the materials, mainly the part of the price which should be paid to foreign producers and now is going to the very poor families which are making adobe bricks. How we get from our house to place of work is a major factor in daily living. In most developing countries, public transport is insufficient and inadequate and most people simply have no way of getting to work other than a several kilometer footmarch. Thus, part of our response to integrated and environmentally friendly development was to make bicycles available to the masses. A process of investigation and synergies with other organizations revealed that almost all of the worlds bicycle parts are manufactured in India and China. Thus, we were able to involve a Latin American engineer studying the question of bicycle transport in Europe. We dispatched him to India to investigate the situation and eventually he instructed the first workers and this paved the way to several bicycle assembly projects. The full bicycles in knocked down state were purchased in India and shipped to Nicaragua to be assembled. This local industry has become fully self-sustaining and for around fifteen years has provided a viable means of transportation to the local population. I is easy to know when the town of Rivas is approaching, as dozens of bicycles began to appear on the roads. Bicycle traffic is commonplace in this southern area of Nicaragua, as workers mobilize themselves to the sugarcane fields or factories, deliver bread or mangoes, and schoolchildren get to classes on time. Not only is the bicycle an environmentally friendly means of transport; for most people it is an achievable dream. 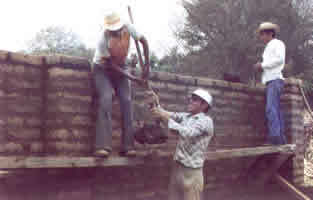 Taken out of From Disaster to Dignity"
A pool of international experts in the fields of construction, planning, management, evaluation and disaster prevention, can metamorphose into multi-disciplinary consulting teams, such as those who were engaged in post-disaster reconstruction in Nicaragua and Honduras. Expertise in EcoMaterials covers the spectrum from research to production, knowledge that has been shared throughout Latin America as well as other continents. EcoSur consultancies have reached many African countries, including Namibia, Kenya, Nigeria, Mozambique; Asian countries such as Bangladesh, Sumatra, Sri Lanka, Vietnam; as well as Tajikstan and Jeman. While Spanish is the common language at EcoSur, we can draw upon expertise in English, Russian, French and German.